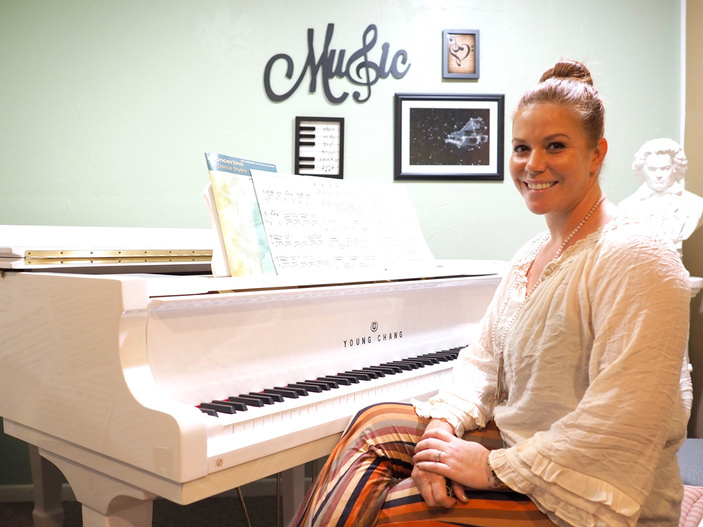 MARBLE FALLS — Amber McHose understands that, as the executive director of Harmony School of Creative Arts, she’s not going to make a million bucks. That’s OK with her because it’s in the bigger mission where she finds her returns. McHose joined Harmony School of Creative Arts in January as a dance instructor. In May, the nonprofit’s board named her the school’s executive director. Along with a comprehensive background in dance, McHose brings a wealth of experience in working with nonprofits as well as a knowledge of sales and marketing from a career in business. “This position lets me bring all those things I love doing together, and for a great cause,” McHose said. Harmony School of Creative Arts started in 1999. It was the brainchild and passion of Barbara Bend, who served as the executive director for 16 years before retiring in 2016. One of Bend’s goals at Harmony was to offer the Highland Lakes community a high-quality arts program to rival those found in larger cities. Bend, along with great instructors and community support, did just that as evidenced by the programs and student successes over the years. McHose plans to hold true to Bend’s vision and build on the strong foundation and framework established at Harmony School of Creative Arts. One of the best ways to do that is continuing the tradition of bringing the best instructors to Harmony. McHose and the Harmony staff focus on student learning, not numbers. The irony of it is that by striving to ensure they offer each student, from child to adult, the best learning experience possible, Harmony offers a good number of classes. The school has fall and spring semesters. The fall semester begins Aug. 20, and registration is open both online at harmonyarts.org or by phone at (830) 693-1791. McHose is also focused on bolstering fundraising for the school. Before she and her husband, Brandon Alan McHose, moved to the Marble Falls area, she was active in the Junior League of Nashville and, prior to that, the Junior League of San Diego. The Junior League is a women’s organization committed to promoting volunteerism and working to better communities. In both the San Diego and Nashville chapters, McHose worked in the fundraising and philanthropy aspects, two things that will help her at Harmony along with her marketing and branding skills from her professional career. She plans to incorporate innovative fundraising programs and methods at Harmony. While Harmony charges tuition for its programs and courses, these fees basically keep the doors open, not give the school much of a reserve from which to draw. It all comes back to school’s basic tenet: serving the students and the community. Harmony School of Creative Arts is located at 1503 Mormon Mill Road in Marble Falls. Go to harmonyarts.org or call (830) 693-1791 for more information.